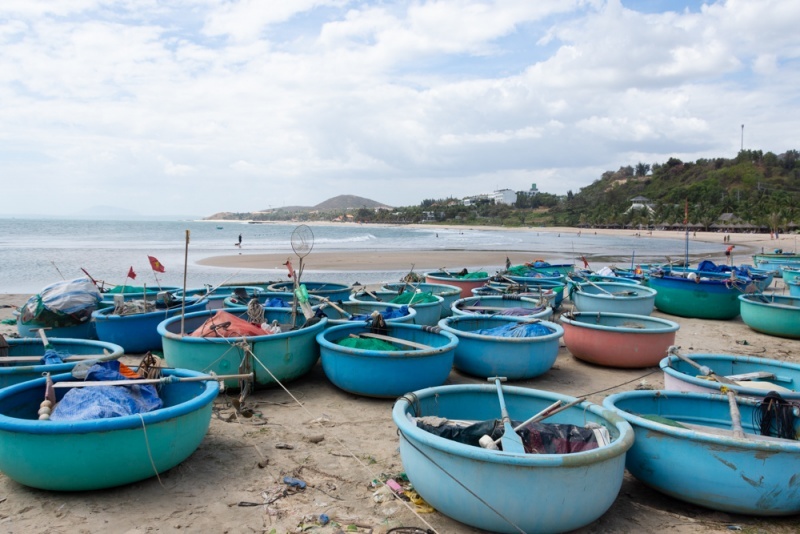 Mui Ne is a small coastal village in an area of Vietnam known as Phan Thiet. It offers perfect conditions for kiteboarding and windsurfing which draws a large crowd of tourists and expats who love the sport. 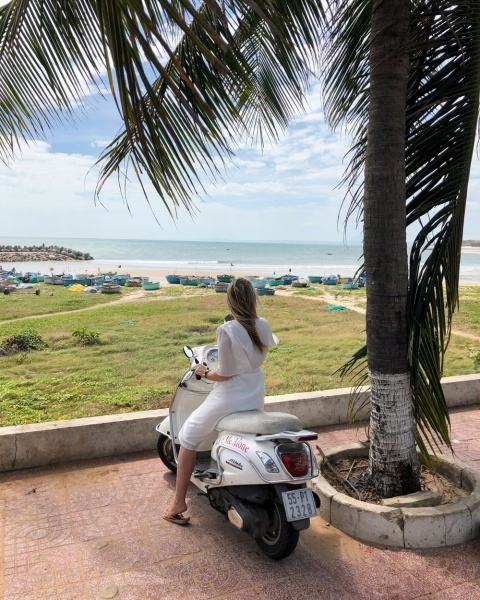 Mui Ne is also alluring to anyone seeking their own little slice of paradise on the palm tree lined beaches where you’re never far from delicious restaurants, lively bars, and relaxing spas. Mui Ne is also quite a popular tourist destination for Russians seeking some sunshine. Many of the signs around town and the menus at restaurants are written in both Vietnamese and Russian. Keep reading to learn all about our 11 favorite things to do in this lovely little coastal paradise! Note: There are a few touristy areas here including Ham Tien to the south and Mui Ne to the north. We’ll be referring to the entire area as Mui Ne to keep things simple. 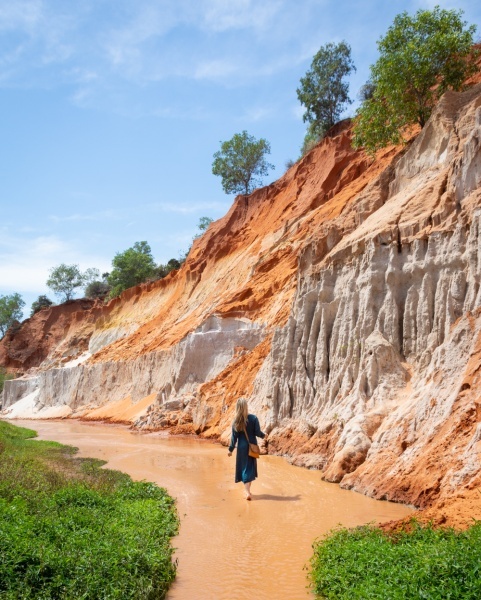 Mui Ne is just a 4 hour bus ride away from the bustling Ho Chi Minh City. Buses leave frequently throughout the day so it’s easy to book a ticket through one of the many tour agencies in town, or head directly to the bus station. Most of the buses are “sleeper” style so you’ll be in a lying position for the duration of the trip. If you book this bus it’s just 200,000 VND per person each way (~$8.50). We don’t find this bus style to be particularly comfortable so we chose to pay a bit more (350,000 VND) for a “limousine” style bus. with just 9 seats. No matter what bus you choose, the trip will take about 4.5 hours with one 30-minute stop in the middle for a restroom and snack break. You can also take the train but it doesn’t actually stop in Mui Ne. You’ll need to get off at the Phan Thiet railway station and take a taxi the remaining 25 miles to Mui Ne. Many people choose to rent a motorbike to get around Mui Ne. If you choose to ride a motorbike to the sand dunes, know that police officers often wait on that road and stop every foreigner who is riding a motorbike. If you don’t have a Vietnamese driver’s license and are riding a bike over 50cc you’ll be forced to pay a fine. You’ll be forced to pay around 200,000 – 1,00,000 VND depending on the officer who gives you the citation. We have rented motorbikes all over Vietnam and have never been pulled over. Apparently it is really only a big problem on this one road in Mui Ne. If you drive south towards Ta Cu mountain, you’re unlikely to encounter any issues with the police. It’s only north of Mui Ne, toward the dunes. There are also plenty of taxis around town (Grab isn’t available here yet) and they are pretty good about giving rides on the meter. Or you can rent a bicycle and cruise around without fear of police. There is not a lot of variance in the weather in Mui Ne; expect warm temperatures, lots of sun, and constant wind (hence all the windsurfers and kiteboarders). 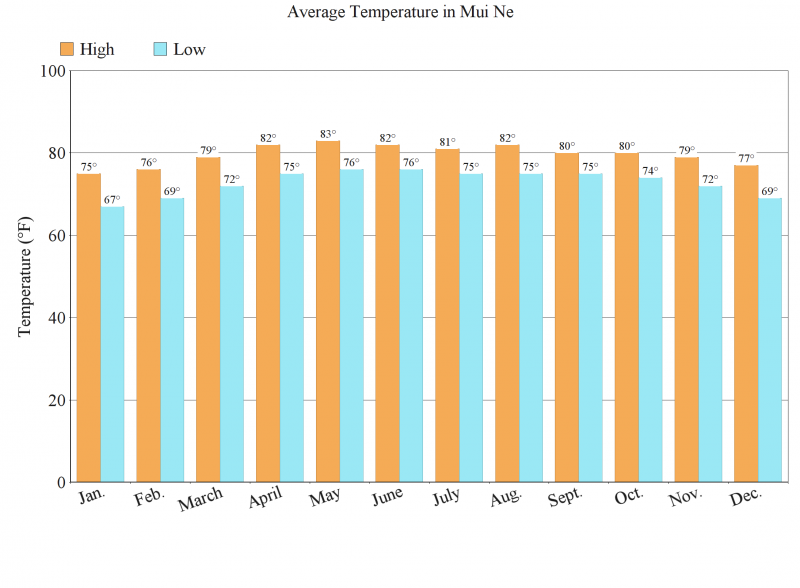 On average, warmest month in Mui Ne is May, the coolest is January, the wettest is October, and the driest is January. The rainy season lasts from May to Early November. 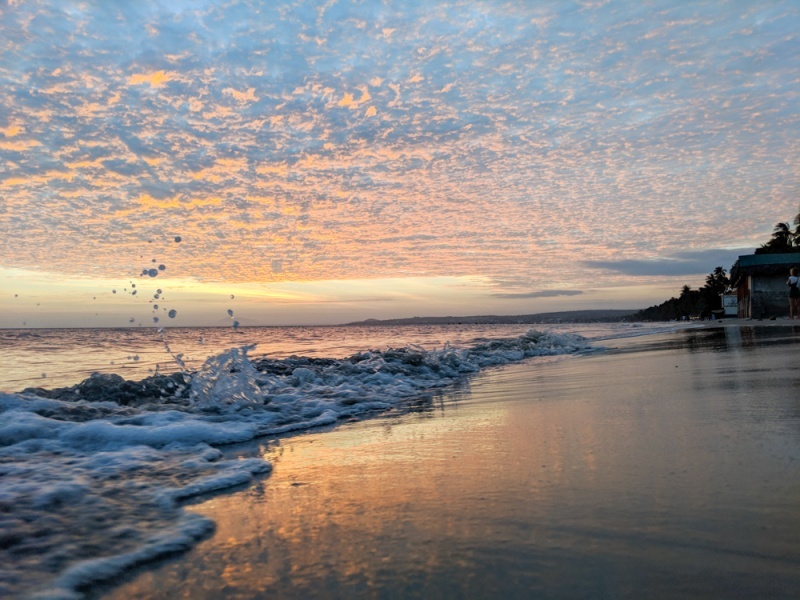 The average annual high is 83° F and the average annual low is 75° F.
Mia Mui Ne Resort is a stunningly beautiful hotel located just a short, 1-minute walk from the private beach area. Rooms are spacious, tastefully decorated, clean, and incredibly comfortable. You’ll love the gorgeous pool and the decadent breakfast! This gorgeous resort features 2 pools, a delicious onsite restaurant, and a spa where you can relax and unwind during your stay. And once you’ve had your fill of relaxing, you can utilize the resort’s yoga room and fitness center. The bungalows are beautiful and well appointed with amenities. 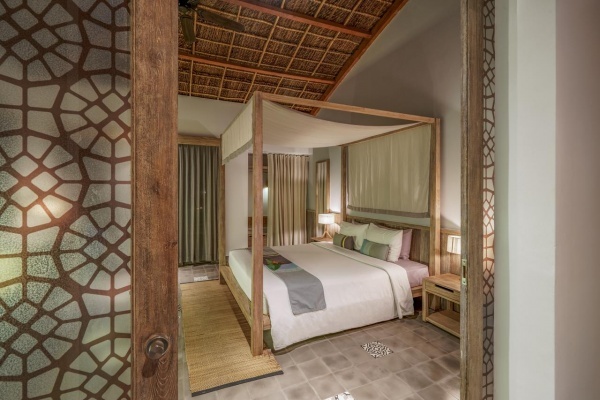 Cham Villas Resort is the ultimate in luxurious accommodations in Mui Ne! 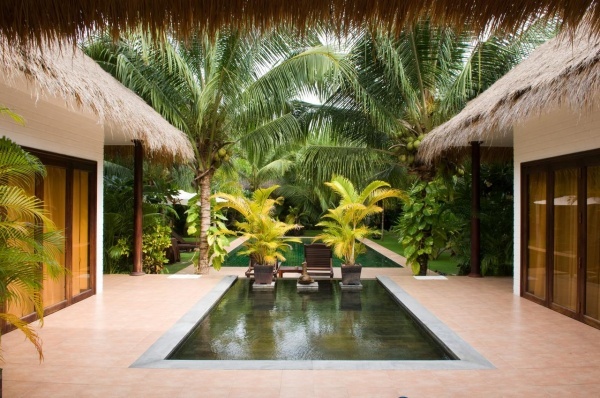 The gorgeous pool is surrounded by peaceful gardens and the open-air spa is the perfect place to get pampered. It’s especially wonderful if you are a couple on a romantic beach holiday, you’ll absolutely love your stay here! As we mentioned above, it is not recommended that you drive a motorbike out to the sand dunes in Mui Ne as you will more than likely incur a fine from police. However, you can take a 4-hour Jeep tour and see just as much! We booked a private jeep through a tour agency in town for 450,000 VND (~$19.50) total for the two of us for 4 hours and 3 locations. We were picked up from our hotel at 4:30am, however, if you don’t care to see sunrise you can schedule your private tour for anytime you want. When you arrive at the white sand dunes you will be offered two options – pay an additional 400,000 VND (total for two people) for a ride on a quad, or walk 30 minutes to the top of the dunes. We sprang for the quad ride since walking up a giant sand dune at 5:00 in the morning sounded exhausting. The quad will drop you off in one spot where everyone else tends to cluster. If you want more privacy you can wander down the dunes a ways. Sunrise from the top is absolutely stunning! Watching the sky turn shades of pink and orange over the miles of dunes is incredible. Be sure to bring your camera and tripod (if you have one), there are endless photo opportunities there. For your quad bike back to your Jeep you can take the exhilarating route in which the quad driver careens down a long, steep, horrifying looking hill. Or take the safer, flatter route. Up to you. 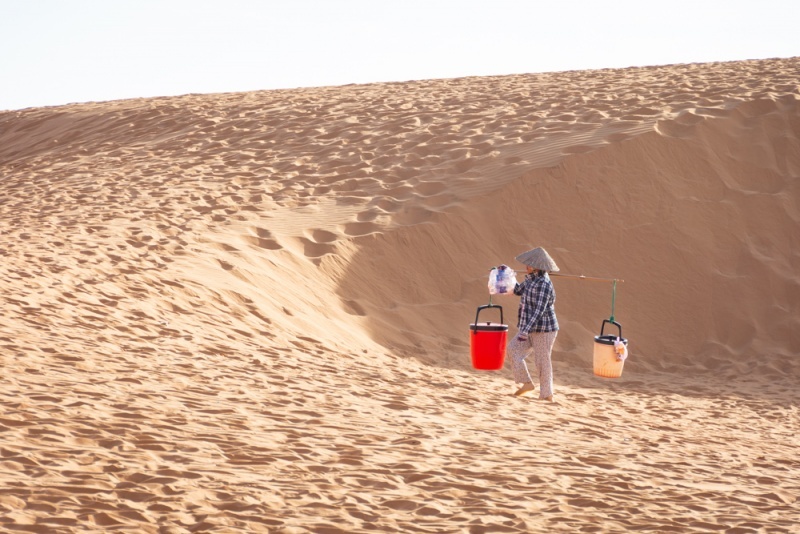 If you take the tour that we mention above, your next stop will be at the Red Sand Dunes. These dunes aren’t as large or impressive as the White Dunes, but the reddish coloring looks beautiful against the backdrop of the bright blue sky. And you won’t be offered a quad ride as these dunes are right off the main road. 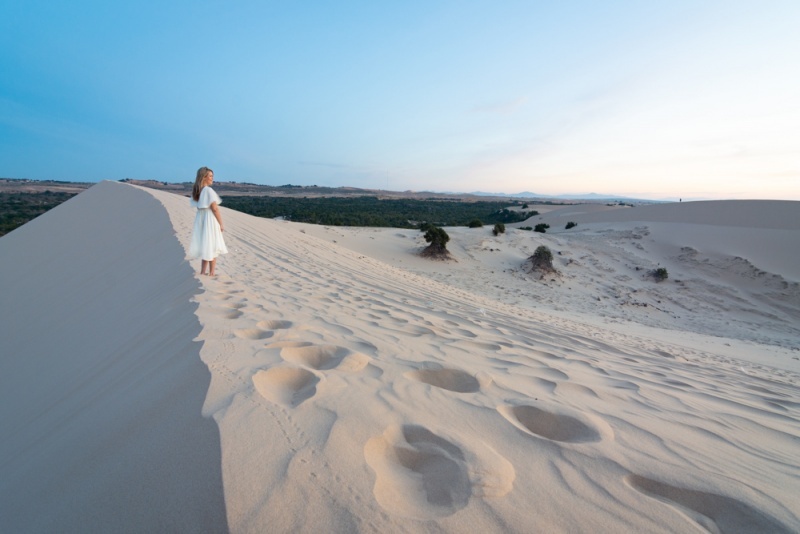 You can wander around the dunes, admiring the views, or rent a plastic sheet from one of the many ladies nearby and have a go at sledding down the dunes. You can stay with them so they can help you get into position, or head off to your own hill to to try on your own. Either way you’ll have a good time! The last stop along the tour outlined above is Mui Ne Fishing Village where the hauls from the night before are being bought and sold, shellfish are being de-shelled, and general mayhem is unfolding before you. It is possible to visit the fishing village on your own, although supposedly the police checkpoint is before you get here from Mui Ne. 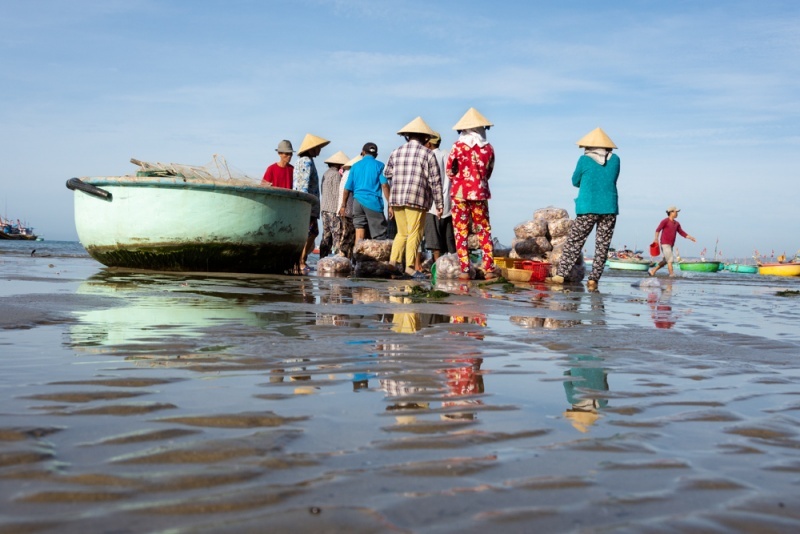 The fishing village is a great opportunity to take some photos of life in Vietnam. The brightly colored boats set against the bright blue sky is a photographer’s dream. 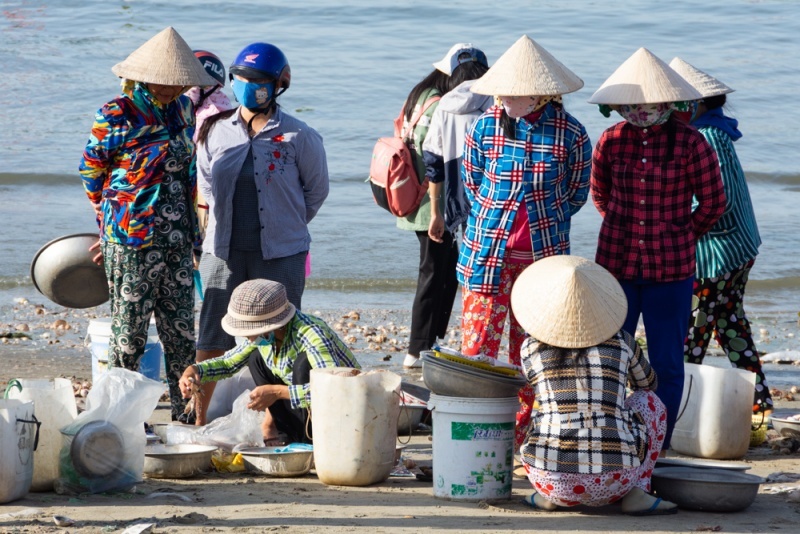 And the women in classic Vietnamese conical hats hunched over bags of shellfish is a fascinating sight to behold. If you do take the tour, you’ll only get about 15-20 minutes here. If you think you’ll want more time be sure to negotiate that with the tour agency ahead of time. Or simply hire a taxi to take you there without the time constraints of a tour. Mui Ne is one of the best kitesurfing locations in all of SE Asia and people come from all over the world to experience it here. There are ideal wind conditions for about 70% of the year in Mui Ne. In the summer (May – October) it’s mainly southerlies while in the winter (October – April) you get more consistent northerly winds. And there are countless operations around town that will rent you kitesurfing equipment and that offer lessons for all experience levels. 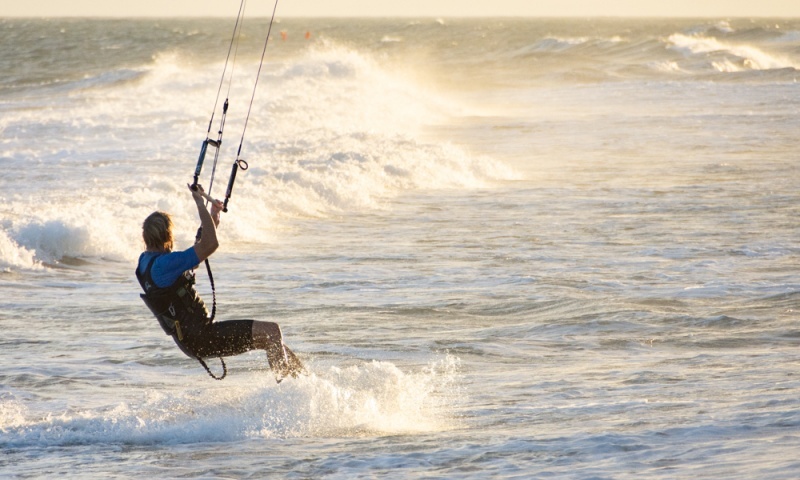 We recommend either Source Kiteboarding or Jibe’s Beach Club. Both operations have a super friendly, knowledgeable, and patient team of instructors. Plus they take your safety seriously! No matter what your experience level, both will make sure you have a great time. The Fairy Stream (Suối Tiên in Vietnamese) is a shallow stream that flows through bright orange and white limestone formations. The landscape is similar to what you’d find in Utah or Arizona. And lush greenery provides some shade which you’ll appreciate in the heat of the day. Take your shoes off at the beginning of the walk and wander through the water. You’ll need to pay the entrance fee of 15,000 VND for adults, 7,000 VND for children and your ticket will be checked twice during your walk. After about 3/4 of a mile the water gets quite deep, you can follow the trail off to the left if you prefer to keep your shorts dry. And there is a small waterfall at the very end. The entire walk is about 2 miles round trip. The Fairy Stream is indeed touristy, but worth visiting regardless. Tour groups begin showing up around 12:00pm so best to start early if you want to avoid crowds. If you are crafty by nature, like to meet new people, and want to take a unique, handmade treasure home with you, then a macrame class is the perfect activity in Mui Ne! 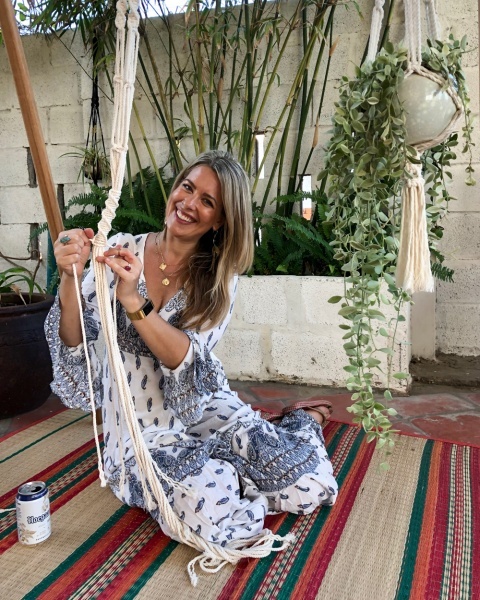 Lea is the owner of The Knotted Ropes, a business that sells amazing macrame pieces and leads weekly classes so you can learn to make your own! The wall-hanging class takes about 5 hours and the plant hanger class takes about 3. You’ll be provided with all of the materials to make your new treasure, as well as some yummy drinks and snacks. You’ll leave with your very own handmade art piece for your house. Plus you’ll learn valuable macrame techniques so you can make more when you get home! Send Lea a message on Facebook to book a class! 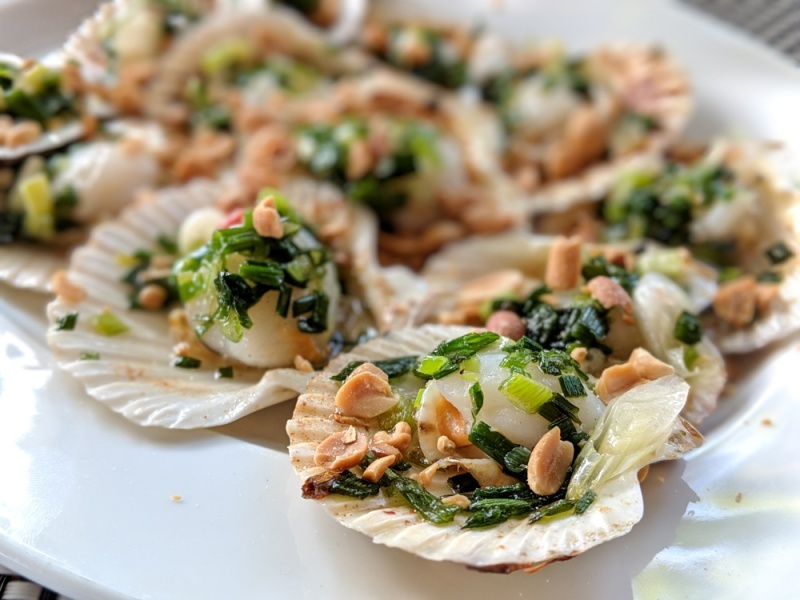 Garlic Restaurant is a delicious spot for fresh seafood. They have a giant menu ranging from Russian comfort food to Vietnamese classics. Be sure to try the clams with peanuts and green onions and the calamari sauteed in onions and butter! And speaking of seafood, BiBo Restaurant is more centrally located in town and serves fresh seafood in a variety of sauce options. The raw oysters with wasabi are a must here, they are delicious! And the red snapper is a whole fish cooked in butter that is flaky, tender, and so delicious! We had a few go-to lunch spots in town that we would highly recommend. Red Pho Asian Hits Cafe has amazing soup options – try the beef ramen if you’re tired of Vietnamese food! The passionfruit lemonade is also a must-try. And Tram An – The Eateria has the best veggie feta wrap we’ve ever eaten! If you want a lot of variety at really reasonable prices, Dong Vui Food Court is the perfect place for dinner! It’s an outdoor courtyard area with lots of tables in the center of several small restaurants, organized in a u-shape. You’ll have your choice of Indian, Thai, vegetarian, Vietnamese, and plenty of other delicious options. Plus there is a bar serving up beer, wine, and cocktails so you can make a night of it! If you’re looking for a beachfront bar with a prime view of sunset, look no further than Le Miracle Chill & Grill. Chez Oahn, right next door, often has live music around sunset if you prefer a sunset serenade. And speaking of music, Joe’s Cafe almost always has live music (although sadly no sunset view) so they’re a great choice to hit up later in the evening. 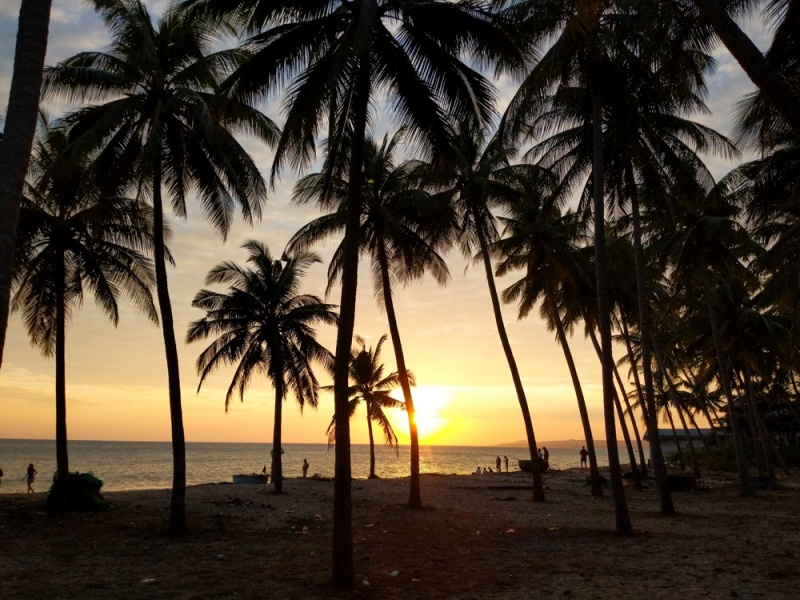 If you’d rather grab a few cold beers and a towel and sit on the best for sunset, our favorite spot is right in front of the Damina Boutique Hotel. The beach is lined with palm trees and you can actually see the sun setting over the sea. Be sure to buy beers on the road because there are no drink vendors hanging around here. Both spots that we recommend for kiteboard lessons also have really chill bars. Jibe’s Beach Club has comfy couches, great food, good music, and a really relaxed vibe. They have a great twice daily happy hour but their prices are really reasonable regardless of the time of day. And for the best views of the coast from a rooftop bar, Source Lodge is the place to go. They have plenty of seating and uninterrupted views of the sea. 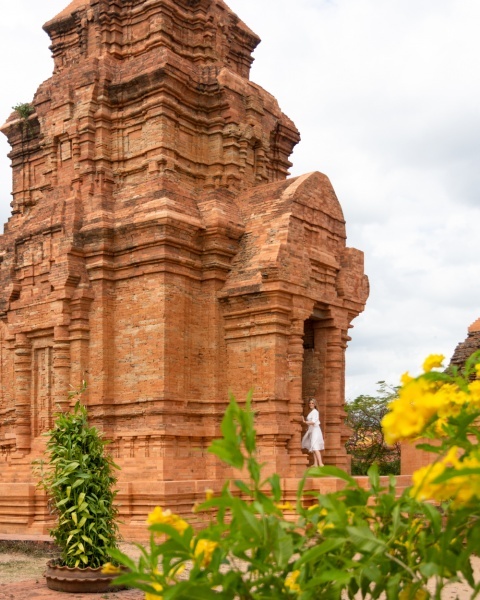 The Po Shanu Cham Towers are remnants of the Champa Empire, similar to the My Son Ruins outside of Hoi An. They have been here since the 9th century and are still used for religious purposes to this day. The towers are about 5 miles out of town, and on the way to Ta Ku Mountain, so it’s easy to rent a motorbike and visit both. There are two towers, both have been well maintained and expertly repaired. And from their position high on the Ong Hoang Hill, you’ll have lovely views of the coastline below. The area is not as large or impressive as My Son, but the drive out to the towers is a beautiful and peaceful one. On the way back into town, be sure to stop at the Ong Dia Cape where women are selling coconuts and the beach there is nice and quiet. There is also the Forgotten Land Sand Sculpture Park with intricate and impressive sand sculptures that people of all ages will enjoy. Ta Cu Mountain is actually located 30 miles southwest of town and will take you about an hour to get there on a motorbike. There are no police checkpoints this way (for now), so you are okay to drive on your own. Not only are the views from the top of Ta Cu spectacular, but there are also several impressive temples and Buddha statues for you to visit. As you enter the park you’ll pay your fee and then park your motorbike (or exit your taxi, depending on your transportation preferences). Once you’re through the gate you’ll be picked up by a shuttle that will drive you a short distance to the base of the cable car. This is a very short walk if you’d prefer to get your steps in. There is a restaurant at the top of the cable car and a few other drink vendors sprinkled around the complex. The layout forms a letter L so you’ll need to choose your first direction and then come back the way you came to see the other section. There are beautiful temples, statues, and elaborate gates throughout. The real treat is the giant, stark white reclining Buddha high on the hill, overlooking the complex. Entrance Fees: 250,000 VND for cable car round trip ride and entrance fee, 150,000 VND for children. 5,000 VND for motorbike parking. Mui Ne is known for having beautiful and serene palm tree lined sandy beaches. And finding your own little piece of this paradise is relatively easy. South of town you’ll find a quiet beach right next to the Ong Dia Cape. The water is calm here and ideal for swimming. Just north of there, near the Mia Resort, is a popular place for kiteboarding. The beach is wide and clean, ideal for lounging while enjoying the pretty kites flying across the ocean. 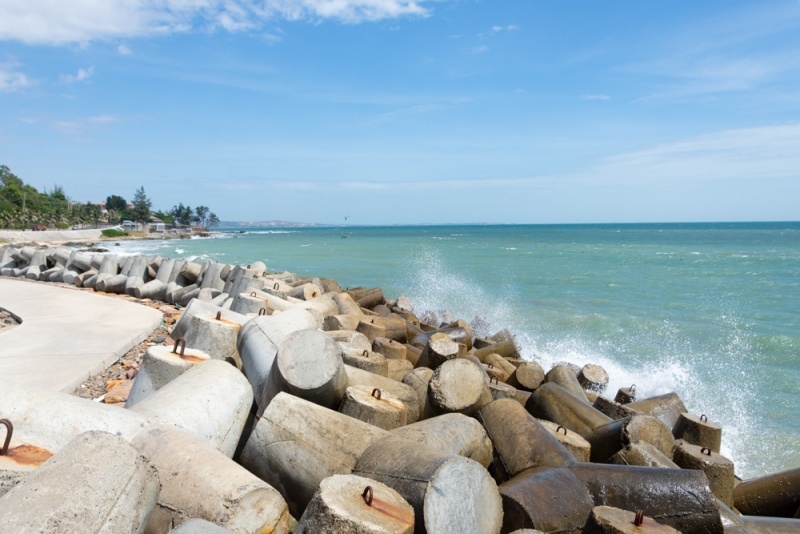 As you head north into Ham Tien you’ll find that the beach disappears and is replaced by stone walls that block the rough surf. Unfortunately you can’t walk along the coastline here. Even further north, closer to the Fairy Stream, the beach opens back up again. Here you’ll find miles of beautiful beach and very few other people. And the Mui Ne peninsula has plenty of beaches as well but they tend to be more cluttered with trash. Further north of Mui Ne, toward Long Son Beach, is another long stretch of coastline. Pick any spot here and enjoy! You’ll love lounging on the secluded beach in front of your lavish resort, sipping cocktails and reading a good book. We loved lounging on the beach in front of the Damina Boutique Hotel because there were plenty of palm trees to provide shade and very few other tourists. There are a few small beach restaurants nearby if you want a cold beer or a snack. 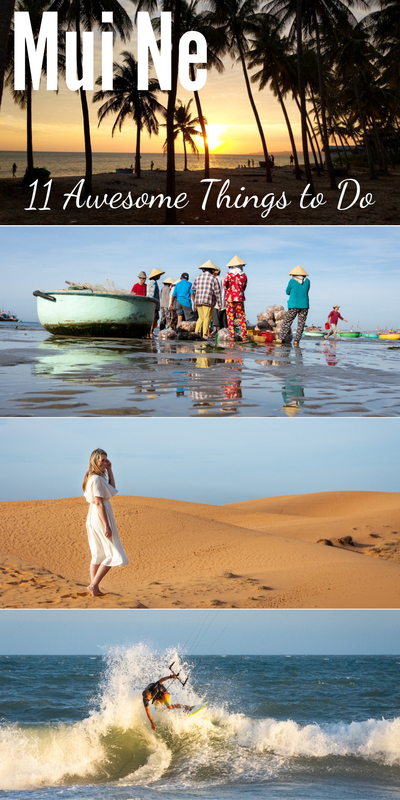 Have an amazing trip to Mui Ne! Planning a trip to Vietnam? 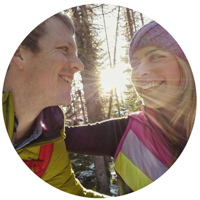 Check out our favorite travel books and resources!